In the heart of London’s theatre district opposite the Savoy Hotel, where rooms cost up to €700 a night, scores of people are lingering patiently. The snaking line near a branch of Coutts & Co, the bankers to the Queen, displays a portrait of contemporary London: men and women of all ages and ethnic backgrounds, some speaking English and some Polish amid a cacophony of other languages. But they’re not there for a deal on tickets to a West End show or a table at Gordon Ramsay’s joint. They’re there for food handouts. Images of rich alongside poor, homelessness and soup kitchens aren’t new in a city that inspired Charles Dickens and George Orwell, or even unique among major cities. But in Britain today, they reflect a society under increasing strain as Brexit – the relentless quest to leave the European Union – drains political energy and focus from confronting other pressing matters. Government policymaking has been paralysed, unable to address the causes of the disillusionment that led to 2016’s vote for Brexit while eight years and almost £140bn (€159bn) of spending cuts hit public services and social aid. In London, the wealth and glamour of Europe’s most global city mask a struggling underclass in jobs that don’t pay enough to afford the basics. 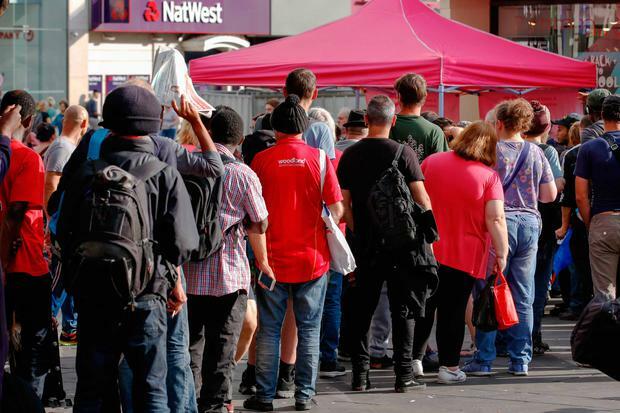 “I don’t have much food so I need to get it somewhere,” said Sean Gibson (41) standing at the back of the line patiently waiting for his dinner from the pink marquee run by Friends of Essex and London Homeless. He said he can’t earn enough to pay rent and eat as a courier for a food delivery company. At most, he says he was earning £960 every six weeks in a city where average monthly rents are about twice that. “Half the rents here are £600 and up. How can people afford that? It’s ridiculous,” he said. Britain is increasingly a country of parallel universes. Employment is at a record thanks to flexible work contracts like Gibson’s, the economy is healthy enough for the Bank of England to be raising the cost of borrowing, and absolute poverty rates are at record lows. Yet a report by the Resolution Foundation think tank found living standards rose last year at their slowest pace since 2012. The recovery in incomes following the global financial crisis has even gone into reverse for the poorest 30pc of families, it said. While London is the wealthiest region in northern Europe, the UK is also home to nine of its 10 poorest regions. Public spending in Britain has fallen to about 38pc of gross domestic product from 45pc in 2010, according to the Office for Budget Responsibility. Research by charity Shelter found that 55pc of homeless families in temporary accommodation are working. The 33,000 families represent an increase of 73pc since 2013, according to the research based on freedom of information requests. Prime Minister Theresa May, meanwhile, is battling daily to hold on to her leadership. Eight members of the government quit since she recently announced her Brexit road map. Policymaking has become firefighting as the clock ticks down to Britain’s formal departure from the EU. There have been four different housing ministers in as many years. Policies to reduce homelessness are routinely overshadowed, said Neil Coyle, a Labour politician who co-chairs parliament’s cross-party group on homelessness. “It’s very difficult for us to judge if someone is or isn’t homeless because we’ve had people dressed quite nicely, and they make an effort,” said Steven Stuart who set up the Friends of Essex and London Homeless charity 18 months ago with his wife. “We think of homelessness as a man sleeping in a doorway under a blanket, but it’s on many levels now.” Harriet (21) an east London real-estate agent, fell into the ranks of the homeless when the lease on her apartment expired earlier this year. She then took to renting rooms through Airbnb for two months. In London alone, the number of “hidden homeless” could be 13 times greater than the numbers on the street. As many as 12,500 people don’t have a fixed abode, though they aren’t included in statistics. And the number of sleepers on night buses more than doubled to 213 by the winter of 2015 and 2016 from the same season in 2012 to 2013, according to the mayor’s office.